Feature-length documentary film on the Burgundy region of France and a select group of winemakers, released 2014 by FilmBuff, created by InCA Productions. What lies within the rhythm of a year? The vines bud and grow leaves and tendrils, and are trained, cared for. They make grapes, and a small, diligent army of hands comes to carry them away. The stripped vines die back, dry and brown, and turn to brush. The brush is burned, going into the wind as a curl of smoke and into the ground as ash. This is a year in Burgundy. Experience the year with French wine importer Martine Saunier as your guide. The film is in four season-sections, and plays out against that backdrop: spring showers, drought, heat wave, hail and storms, harvest moons and the damp cold of winter. Each vintage is a time capsule, a bottled piece of history of a very specific year, with its particular weather pattern, its crises and its triumphs. It all goes in, whether you want it to or not, and 2011 was full of drama. In the film, we get to know our half-dozen wine-makers: they are artists, whose personalities shape the flavor and style of the wines they lovingly craft. There is joy, fear, anxiety, triumph, and laughter in their experiences. With the Morey-Coffinets, we meet three generations of wine-makers, and little two-year-old Celeste, the first of the fourth generation. In Lalou Bize-Leroy, we meet the uncrowned Queen of Burgundy – now in her eighties, still involved in every detail of her winemaking, creator of some of the best-renowned and most famous wines on earth. We get a sense of the deep history involved. Though they use many of the latest equipment and techniques, the secrets of winemaking in Burgundy and the discovery of the best terroirs (and how to exploit them) have been developed since Roman times. Indeed, the Cistercian monks kept the art alive during the Dark Ages (500-1000) and developed a whole industry in the Middle Ages: their central wine-making HQ, Clos de Vougeot, still exists, and is the location for one of the central scenes of the film: a great mid-summer banquet. This is a year that went into the bottle and onto film. This is our capsule. The grapes grow. The grapes die away. What is left always in the frame is a way of life. For more visit the film’s website. 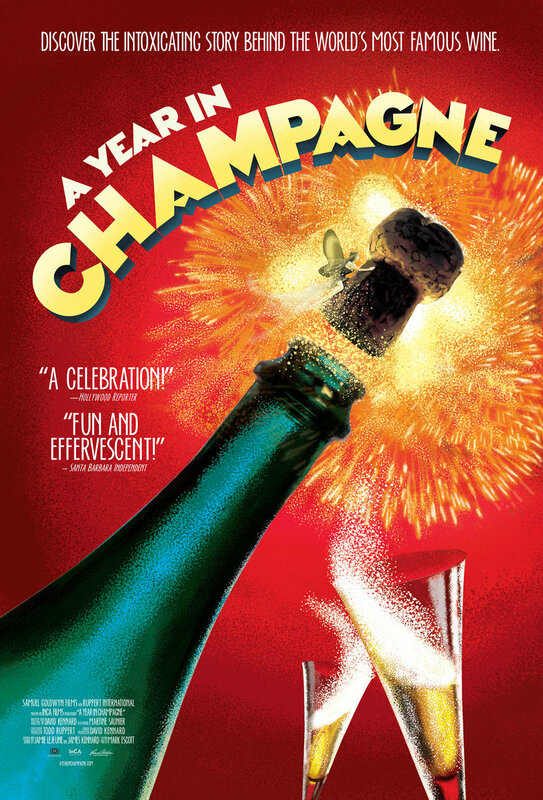 Feature-length documentary film on the Champagne region of France and select winemakers, released 2015 by Samuel Goldwyn Films. The blender of the wine works like an alchemist, mingling the brightness of one year’s summer with the difficulties of another year’s spring to create a better vision, and a taste experience that is true to the house’s style; then creating the bubbles in just the right amount, so the bottle won’t explode. After all, as customers we don’t even consider the fears of the winemakers. We crave the fantasy: the special zing of our favorite bubbly, when we push out the cork, the first tingle of bubbles on the nose, the taste explosion in the mouth, the thrill of the moment when you swallow pure gold… For more visit the film’s website. Time. In modern life, it has become the greatest luxury. Yet no great Port exists without it. It is written into the wine as fundamentally as sun and rain. To make Port, you need old native vines that produce a multitude of flavors from their perch on the steep hillsides. Then you need vineyard workers who know the old songs, who pick the grapes and stomp them with their bare feet in great stone tanks in the same rhythm that their ancestors tread. You need barrels and dark apothecary jars filled with wines made throughout the last century to enrich your blend. And then you must be prepared to wait. With renowned wine importer Martine Saunier as our guide, we journey into the world of Port with four venerable producers: Symington Family Estates, Taylor Fladgate, Ramos Pinto and Niepoort. The story of the Douro Valley in northeast Portugal reaches back into the Paleolithic. Stone engravings bear testament to people making their home in these hills for the last 50,000 years. While the native roots of viniculture run deep, the modern Port trade got its start nearly 400 years ago, and the British have had a hand in shaping it ever since. 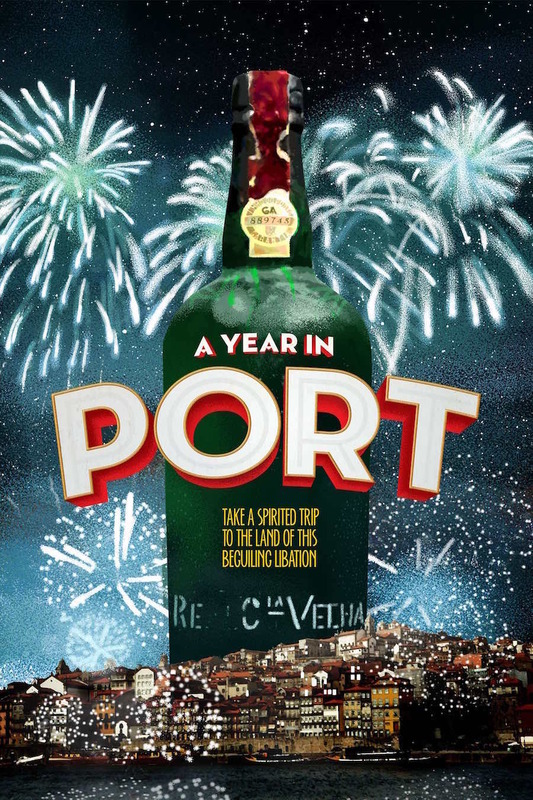 While many think of Port as a drink for old men in the halls of power, it’s not all cricket and a rousing chorus of Rule Britannia — although there’s certainly plenty of that. In Oporto and up in the Douro, we find Port’s more sensual side, with traditional folk songs and dancing on the grapes after harvest, to Saint’s Day festivals that keep people carousing in the streets all night. We explore the mysteries of the vineyard, which may hold the key to the region’s future through the rise of new table wines. There are more than 400 native grape varieties, sometimes 30 or more varietals mixed together in the same vineyard. We enter the world of the Master Blender, who reaches back through the years, sometimes more than a century of wine, to find just the right note for the blend. Join us as we explore the tangle of time that is Port, where the wines of the past continue to flavor the wines of tomorrow. And as in the vineyards, finding the Douro’s future may lie in decoding the messages from its past. For more visit the film’s website.